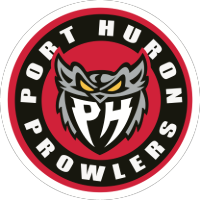 Danville, IL - The Port Huron Prowlers hockey team accomplished a game 1, overtime victory over the Danville Dashers by a final score of 5-4. Prowler goals by Matt Graham (2), Jonathon Juliano (2) and the game winner by Matt Robertson. The team makes the trek back to Port Huron for game two of the best of three series, tomorrow night. Puck drops at 7:30pm at McMorran Arena. Get your tickets at the McMorran box office or Ticketmaster.com.